The 219 House and Annex is absolutely lovely. Just a few minutes walk from the beach and central to Kennebunkport for plenty of shopping, sight-seeing and dining. The property is truly an idyllic spot to host a magical getaway or retreat! Last year, the 219 House rental business took off with requests for destination retreat bookings. It's the perfect setting for a small group in the off-season, and I even held my own women's retreat there for thirteen this past April. The 219 House lends itself well to many aspects of a retreat. With over 5,800 square feet of space, a beautiful yard, and a huge wrap-around porch, there are many options for break-out rooms, sleeping arrangements, and quiet nooks of the property for introspection and reflection. 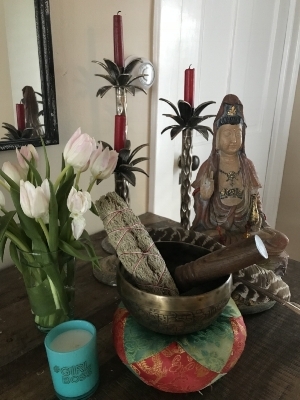 It's easy to find a spot to curl up, journal, or meditate and It's also just a short walk to the beach from the house, to take in the gorgeous coastline. There are many places to walk while on retreat including the grounds of the Franciscan Monastery, the walkway along the Kennebunk beaches and several winding quiet back-roads. 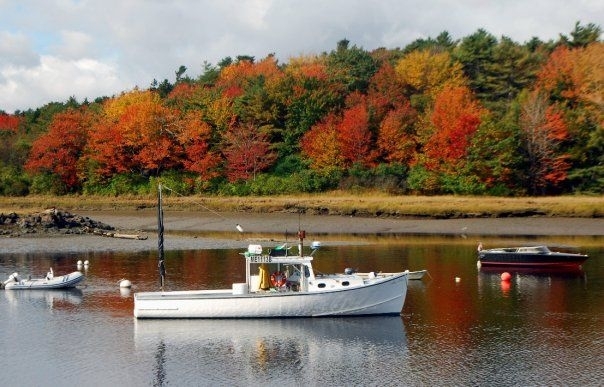 While Maine tends to be cooler in the off-season, fall is a gorgeous time of year to see the foliage, and the spring months are also beautiful as the tree's and flowers bloom. The fireplace in house is wonderful to sit beside and have a group meal, and the house is warm and cozy during the winter weeks too, having formerly been a year-round home. Did I mention that the house has two back-to-back kitchens? If you plan on having an event here, the extra kitchen is a huge plus. There are two refrigerators, two ovens and even two dishwashers that can be used by your group or by the caterer of your choice. If you'd like to have your retreat attended by one of the local gourmet catering companies in the area, the kitchens make for a convenient place to prepare meals for large groups, and the seating for the dining area can be arranged to accommodate up to 25 or more for a sit down meal. We configured our seating area for 10 participants and 3 guides at the front of the room who delivered the retreat material. We have plenty of stools and extra seating to offer you should you need them. A mindful moment from our P.A.U.S.E. & Reveal Retreat. The house has 8 bedrooms, with one of them being an enormous "common room" with 6 individual beds ( This room is huge!). There is also an additional "annex" apartment across the driveway that offers 3 more private bedrooms ( as well as another living room and kitchen!). In terms of having extra bonus space to hold a yoga class, performance, movie night or an activity where you might need to spread out, look no further than the large, spacious, game-room over the garage. With a large flat screen television, big leather couch, extra large extendable pine table and plenty of additional seating, it's a great spot to gather for a morning meditation, a stretch, or to show a film, or host a guest-speaker. The Annex next door is a 3 bedroom unit with a bathroom, kitchen and living room plus plenty of light, wood floors and charm. The wrap-around-porch is also a great place to have a morning coffee in the sunshine or have a quiet place to offer your retreat guests to reflect. As the retreat host/ hostess, you'll genuinely appreciate the many options available for configuring the perfect space for the perfect occasion or group-activity. The property is versatile, inviting, and beautiful! The Wrap-around-porch is also a plus. If you are interested in holding an event in our off-season, please consider booking between the dates of September 15th - June 15th for our special nightly rate by contacting our partner Evolve Vacation Rental. If you have questions, just call 877.818.1014 and they are always happy to help. Click on the image above to be taken to the site for booking. The rate above includes all fee's taxes, cleaning, & insurance. To book the Annex next door with 3 additional bedrooms you can contact our booking partner and let them know you would like to rent the entire estate or of course, you can just rent the Annex with a couple of friends instead! To see photos and details about the Annex click here. Evolve Vacation Rental can book your group at either or both of our properties. Please reference listing # 356546 for 219 House and reference #356943 for the Guest House Annex next door. 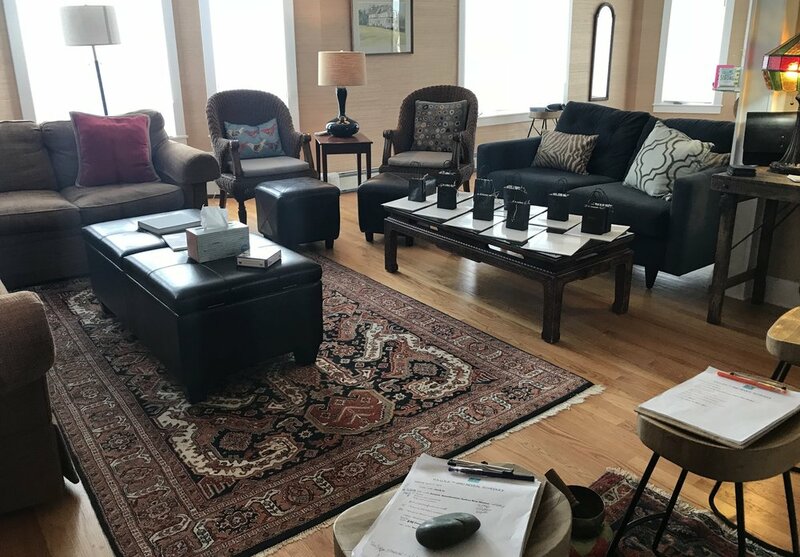 If you have additional questions or wonder if our home is the right fit for your group, please contact me for ideas on planning your next group retreat. These rockstars had a blast making the 219 House their retreat getaway last Spring!